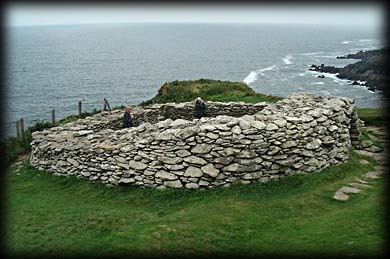 Located at the base of Mount Eagle on the Dingle peninsula is an impressive promontory stone fort. The fort has suffered a lot of damage due to erosion but is still very impressive. 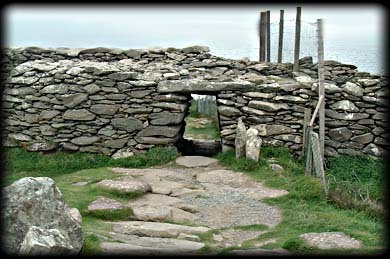 Inside the fort is a circular Beehive hut or Clochan with a square interior. The fort has four outer defensive banks and a souterrain about 16 metres long, leading from the front of the outer defenses to the interior. Unfortunately further parts of the fort slipped into the sea during the storms that battered the west coast in January 2014. The site is now extremely dangerous and has been closed to the public. Situated: On a cliff promontory projecting South into Dingle Bay.From Ventry take the R559 West after about 4 Kilometres you should come to the fort on your left, it is well sign-posted. Discovery Map 70: V 3499 9734. Last visit May 2013.